Marc Oller, director from Spain and part of the production company Canada, creates content that everyone (not only Canadians) can appreciate. Carefree and teen-aged you can’t help but fall in glove with the way he sees the world. We interviewed Marc about shooting a double music video for The Parrots and Hinds, two indie bands based in Madrid, who recently released a split 7″ with Burger Record for their cover of Thee Headcoats‘ “Davey Crockett” and the supergroup The Almighty Defenders‘ “All My Loving”. Lola Who: Who came up with the concept for this collaboration between Hinds and The Parrots? Marc: Hinds and The Parrots are actually best friends. They released a Split EP together with these two songs and they thought that it would be interesting to make a double music video together too. The project arrived to Canada, a production company, and we knew this was something kind of unique. I was already a huge fan of the two bands, so we accepted the job. Then we developed the idea for the video. Lola Who: Hinds did a cover of the song Davey Crockett by Thee Headcoats, and The Parrots covered the Almighty Defenders with the song All my Loving. Who chose those songs? Is it the artists, or the production house and yourself? Marc: The songs were chosen by the artists. Although the songs are not composed by them, they play these two songs in every concert. Lola Who: The Almighty Defenders and Thee Headcoat are two 60s influenced garage rock bands. Are you a fan of that type of music, because we certainly are! Marc: Of course I am! I used to play the drums in a garage rock band. Lola Who: What is the inspiration behind this video? Marc: This video is an ode to that perfect summer night with friends. We wanted to depict this joy of being young and carefree, the fun and the energy behind a crazy night out with your friends. Somehow when I listen to these songs, that’s how they make me feel. Lola Who: Does this video reflect an idealized version of life, or real-life? Marc: I dont think its an idealized version of life, but the best version of a real life night out with your friends. Theres instead some moments of idealizationthe tunnel sequence or the red light moment in the skate park, for examplebut they are part of the music video language and I use them as a metaphor, not for describing. We all have this night in our memories when we went out with our friends and everything was perfect. That epic night full of stories, one of a kind. Thats what we wanted to depict in our video. Lola Who: How did you interact with Hinds and the Parrots? Did you just let them do their thing, or did you give them precise direction to define the look and the story? Marc: When I shoot I always need to have everything under control; every shot, every scene, every small detail. But I wanted to try something different this time. I wanted to let the movie flow by itself and be there just to capture it in a personal way. But in the end, its always a mix of improvisation and a precise direction. I created a storyline, then I asked the artists to send me videos of themselves doing silly and cool things, and that gave me lots of ideas. After this, I remade the storyline and added some scenes. We had everything prepared in the set to let everything go in a natural and organic way, so we were ready for every new idea that could come or anything that could happen. There were plenty of moments when these boys and girls were doing funny and silly things, and I would run to the DOP (Director of Photography) and yelled “Film that, quickly!” So I guess that half of the movie was prepared, and the other half was fresh and pure improvisation. Lola Who: Can you give us a memorable moment on set?! Marc: First of all, I have to say that this was the funniest shoot of my life, no kidding! One of my favourite moments was when we were shooting in the skate park and the girls from Hinds were trying to do parkourIve never seen people with so much energy as these girls I swear! And they would yell “Parkooouuuur!! !” while jumping and climbing and laughing all around. And then they would come to me and ask me to do some Markour and I would jump, climb, laugh and yell “Markoooouuur!! !” with them. So much fun. Lola Who: That sounds like so much fun! Where exactly in Madrid did you shot this film? Marc: Actually, it was shot in Barcelona and in the surroundings. We shot most of the video in the center of the city, in the Go?tic and Borne areas. 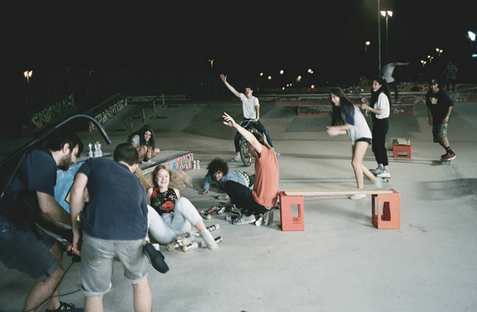 We also shot in a disco called Sidecar, the skatepark was in Mollet, and the house in Les Planes. Lola Who: Is there a film-maker or other artist whose work particularly influences you? Marc: My main influences are my colleagues at Canada. Im a fan of their work and they inspire me every day, with every job they do and with every conversation that we have. Lola Who: What kind of camera did you use and why? Marc: We used a super 16 mm film camera. For me, filming in 16 mm was mandatory, it was a matter of attitude. If I could, I would always (always!) use film. I dont mind if its 16mm or 35 mm, but in this case, I think that the music and the story required the 16 mm format. Lola Who: Do you remember the point in your life when your interest in film shifted from hobby to career? Marc: Has it already shifted!? To tell you the truth, I hadnt thought about that. But now that I think about it, making films is still be both a hobby and a career for me. In a symbolic way, I think my career started when I decided that I wanted to be a filmmaker and started making short films. But I guess that the moment that it turned into a “real” careerI mean when I first got paidwas when I did my first commercial three years ago. Lola Who: What would you tell your younger self if you could go back in time? Marc: Hey dude, be patient. Marc: Make it double, with onion, tomato, lettuce, egg and bacon, please.